Optimize space and time at practice to keep players active on the defensive side of the floor! Legendary St. Anthony's basketball coach Bob Hurley Sr. has amassed 28 state championships in his time on the sidelines. He has coached hundreds of players and has taken great lengths to study today's game to become one of the most knowledgeable coaches in the world. In this video, you'll get the opportunity to learn a smorgasbord of defensive drills and skills from a great coach and excellent teacher. Coach Hurley has built an essential list of daily habits that he requires his players to use. By teaching and modeling these habits, his teams are able to build extraordinary consistency. These daily habits along with the expectation of making practice harder than the game set the tone for a successful season. You will see how Hurley sets the tone and gets his players to work on their weaknesses early in every drill to push them out of their comfort zone. Beginning with a solid foundation, Hurley demonstrates how he starts every year teaching the basics of defense. Skills such as stance, footwork, and hustling after a loose ball have helped his teams achieve great success in high school basketball. Mastering the basics of rebounding, positioning, two hands on the ball, and attacking the glass are all elements a player needs to be a successful rebounder on both ends of the floor. In the Superman Rebounding Series, Hurley demonstrates five different drills you can use in your practices to build a superstar rebounder, no matter if the player is a post or a guard. Each drill makes athletes focus on using two hands, being strong with the basketball, and using a shot fake after getting an offensive rebound. In 6 Man Closeout, your defense must be able to contest a shot and be ready for the drive as a post player sprints out to set a ball screen. Through this drill, you'll be able to teach ball screen defense or a combination of different ball screen defenses that will help prepare your players for game day. Rounding out the video, Hurley demonstrates how to eliminate offensive celebrations and encourage your team to get back on the defensive end of floor. Once the offense scores, a new offense is ready and waiting to push the ball right back, forcing your defense to sprint and contain the ball in the open court. Coach Hurley knows a thing or two about the defensive side of the game. By winning 28 state championships, he has demonstrated that his teams are ready to lock up and shut down some of the best offensive talent on the floor. 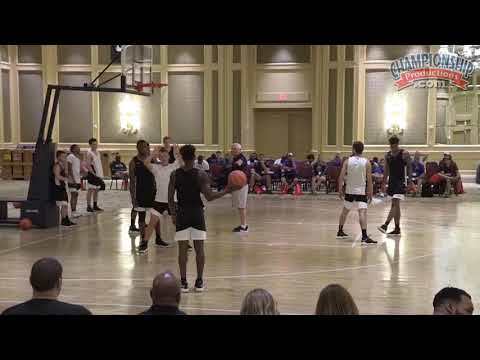 Whether you are a first year coach or a veteran coach, you will benefit from watching and listening to Hurley explain the finer points of playing defense!